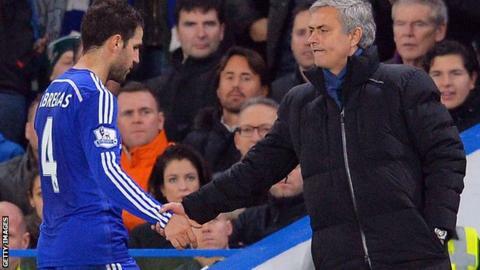 Chelsea midfielder Cesc Fabregas has denied media allegations he is organising a dressing room revolt against manager Jose Mourinho. 'The Secret Footballer' blog claimed he was the "leader" of a "mini-revolt" at the Premier League champions. Chelsea are 15th in the league table. "I would like to clarify that contrary to a few reports from some websites, I am extremely happy at Chelsea and have an excellent relationship with the manager," Fabregas said on Twitter. "There may be certain individuals from the outside trying to destabilise this club but I strongly believe that we will bounce back and come good again," added the 28-year-old Spain international. Chelsea have lost six of their first 11 Premier League matches this season, the latest a 3-1 home defeat by Liverpool on Saturday that left the Blues 14 points behind leaders Manchester City. They are third in their Champions League group and host Dynamo Kiev at Stamford Bridge on Wednesday before travelling to Stoke in the league on Saturday. Chelsea's defence of the League Cup ended at the Britannia Stadium last week when they lost 5-4 on penalties following a 1-1 draw. Mourinho, 52, said he expected to be given time to turn around the club's fortunes after the loss to Liverpool. The Portuguese was given a one-match stadium ban on Monday and fined £40,000 by the Football Association after admitting a misconduct charge over his behaviour in the defeat by West Ham on 24 October. He will miss the game at Stoke on Saturday unless he appeals. If he contests the punishment after receiving the FA's written reasons this week, he could still be on the bench at the Britannia Stadium. The stadium ban is separate to the suspended one he received along with a £50,000 fine for comments after the loss to Southampton on 3 October. Mourinho is the subject of individual legal action from former Chelsea doctor Eva Carneiro, who is also suing the club for constructive dismissal. Fabregas, who joined Chelsea from Barcelona in June 2014, was substituted at half-time at West Ham and came on for the last 20 minutes against Liverpool. The former Arsenal midfielder has scored one goal so far this season, against Maccabi Tel Aviv in the Champions League on 16 September.